Sales representatives are important for any organization for the growth, but hiring a sales representative can be a tedious task. Hiring sales representatives are no piece of cake because they are important for any organization and their quality of work affects at large scale. In some cases, the bad decision causes such problems for the organization that they leave a lasting negative impact on company name and reputation as well as on the revenue. There can be many reasons that lead to hiring a wrong person, but eventually, the sales managers make the most mistakes because they are the one who interviewed a potential candidate for the job. The mistakes that lead to hiring a wrong person for the job are quite common that they can be summarized in this article. Salesperson or Sales Representatives sell products, goods and services to the customers and they are the ones who directly interacts with the customers and can tell what exactly customers’ demands and wants. Sales representatives interact with the customers to understand what the improvements they want are and what are their expectations as well as helps in creating solutions according to the customers need. Sales reps work to find new sales leads through business directories and make sure a smooth sales process for the customer. Sales reps are no doubt an important part of the organization, they are the one who interacts with clients and customers and that’s why they are the one who know the best what customer and client wants and make sure there is no issue regarding this. Hiring a new candidate is always important for any organization because the result of the decision takes long to come out and during this period a wrong decision can do many harms and the good one can do much good. It often happens that the long-term impact of a bad hiring decision ignores because of the reason that a sales rep is a very small part of the whole organization, but when the real evaluation was done, it shows how poisonous this kind of decision can be for both the customers and the business. There are many reasons that can be the cause of bad hiring, but the mistakes made by a sales manager during hiring are the most common mistakes that lead to the bad hiring of a candidate. Some of them are as follows. The person who sits on the chair of an interviewer must be qualified enough to conduct the interview and have knowledge of how to take good, fruitful interview. One of the common mistakes that is often seen on hiring sales rep is that the sales manager who takes the interview have no understanding or qualm how to take a good interview which leads to some ugly result in most cases. The managers have many responsibilities when they are working and one of them is taking interview of potential employees, but they often ignore the fact that although they are interviewers, they too need to prepare well before hiring a candidate for the job. Taking an important interview unprepared is the recipe for the disaster which will brew silenced, but will affect on a large scale because the chances are that mistake is going to repeat again every time when new employees will be interviewed for the job. The main reason for conducting an interview is to know about the candidates who have applied for the job and selecting the best suiting candidate for the job. Asking questions is the way an interviewer selects the candidate by accessing the way of answering and answer of the interviewee, but it has also given space for one of the most common mistakes that often repeats by the managers who conduct interviews. Not asking a question is better than asking a wrong one because a wrong question leads to an answer which is probably irrelevant to the job or too vague to actually answering. Most of the sales managers have loads of work to do, but one of the important responsibilities they have is to take interviews and appoint a potential candidate who suits best according to the job and reference helps a lot in deciding whether the candidate is suitable or not. Providing a reference in the resume is a common standard practice, but often it uses for any benefit. Ignoring reference is another common mistake most sales managers make while selecting the candidate for the job. The reference is given in the resume for a reason and the reason is to know about the candidate and how he/she was at their previous workplace and how suitable they are for the job. The actual experience an employee gain is from the work he/she does, not by the number of years he/she has done the work, because number of years only make your experience grow if you actually have done something productive during the years. But selecting a candidate for the job of sales reps is solely based on number of years of working. Number of years and actual work experience has no strong relevance if the candidate has not used the years to learn and work which is ignored by most sales managers while conducting the interview for the hiring, This makes them hire a candidate with experience as in a number of years and not the one who actually have an understanding of the work. Asking the right question is one of the most important parts of the interview which leads a manager to know whether the candidate deserves the job or not. Failing to ask the right question is one of the mistakes most sales managers do while hiring a new sales rep for the job because failing in asking the right question leads to a fruitless interview and hiring of a candidate who is not worth the job. It is very important that the manager, who is conducting the interview, asks tough and probing questions so that the potential candidate can be tested properly for the job. Our feelings are part of our personality which often helps us in making decisions, but when a sales manager hires a new sales rep on the basis of his/her gut feelings, then it often leads to a big mistake because you cannot decide whether the person is suitable for the job or not just because you have a gut feeling. Gut feelings can mislead an interviewer because there are chances that the interviewer gets such feelings because of the familiarity with the interviewee and it is very wrong to hire a person for such job on the basis of your feeling rather than facts, figures, and qualification. Hasty decisions often lead to disaster, especially in the case of hiring a new candidate for the job. There are many candidates out there, who apply for the similar job, but not all of them are qualified for the job. The interviewer decides to hire by thoroughly inspecting the résumé, reference and by interview, but when all of it is ignored then chances of mistakes are very high. 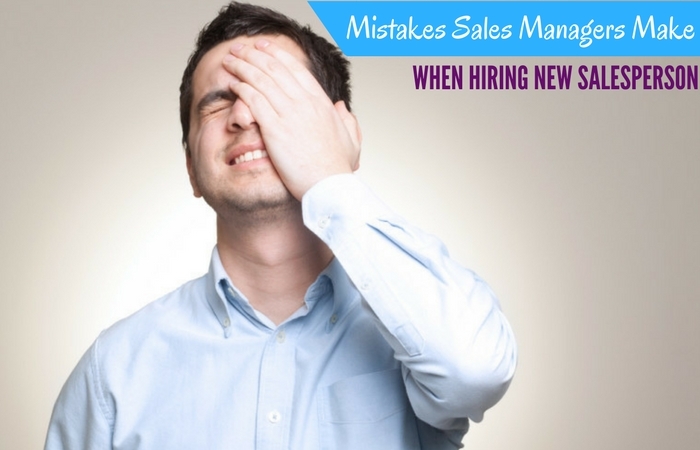 When a sales manager makes hasty decisions about hiring a sales rep without doing a proper background check then it is a sure mix of mistake which is going to cause many problems for the organization in the long run. A good job description is necessary for an organization to hire a suitable candidate for the job. Most candidates apply for the job after reading the description and if the description of the job is not proper and well written by the manager then he/she is never going to hire a right candidate for a sales rep job. Hiring an employee on the basis of the poor job description is the mistake many sales managers make. They don’t know how to write a suitable job description which leads to the wrong job application and then to a mistake of hiring a wrong candidate simply because they are too confused about the job they are hiring the candidate for. It is normal for a manager to race the process of interview and hire the candidate for the job of rep because hardly any manager enjoys the process of interview to hire a sales rep. The decision of hiring based on the need to fill the gap often makes the manager hire the first candidate who looks promising for the job, but this kind of decision normally promotes to employing regret because the results are not as managers think at the time of hiring. Interviewing a person for the job of sales rep requires more than one perspective. Most of the time managers want to get done with the process and avoid taking the second opinion because it makes the process lengthier and time bearing which ultimately leads to a mistake. Effective managers take the perspective of the entire members that involves in the interviewing process and compile their feedback before taking the decision. Another mistake that most sales managers make while hiring a sales rep is using the assessment tool as a crutch or not using it at all. The assessment tool is to test the candidate for all the qualification he has and not to use it for making the decision solely based on the test. The assessment test is necessary but can lead to a mistake if it’s taken for granted or if used as a major equipment to make the decision. The goal of the interview is to make the potential sales rep to talk more and for managers to observe so that they can analyze the candidate and understand that if it is worth the job or not. Too many managers take most of the time of interview by talking about the job, expectation, and company which is a huge mistake on the part of a manager. Sales managers are always busy on one task or other which often result in interruption during interviews which are a huge mistake on the part of the interviewer and allowing the interruption leave a bad mark on interview and candidate. The interview must be conducted in peace and without interruptions by any staff. Sales managers often get caught up in taking an interview for a sales rep and handling another task which leads them to confusion on how to take the interview. The poor quality interview means a waste of time, energy, and money, and also hiring a wrong candidate. It is the mistake most managers do often because of their busy and hectic schedule, but an interview must be an affair with utmost sincerity where a manager can select the right candidate for the job. Hiring a new candidate is always a tedious job and need lots of efforts from the interviewer’s part because the interview is all about selecting a right candidate for the job and it cannot be done without preparation. There are many mistakes a sales manager makes when hiring a sales rep and the reason could be anything. In this article, we had discussed some of the common mistakes and hope that this can help you in making the interview a more productive affair where a good candidate can get the job and organization a good sales rep.